Why	Choose	A FULL-SERVICE REMODELING COMPANY? …gathering quotes and choosing all the right subcontractors, checking each time for proper licenses, liability insurance, workman's compensation, references, and dependability. …creating and overseeing a proper contract for each sub, detailing the specifications of the work. …shopping many different stores, selecting products without the help of an experienced design consultant. …ordering those products, ensuring they arrive on time and in perfect condition. …establishing and coordinating work schedules, making sure all the subcontractors show up when promised and complete all tasks in a timely manner, and ensuring nothing gets missed. If you have the time, the contacts, the experience and the patience to deal with what can be described as an overwhelming and frustrating experience, this path may be right for you. On the other hand, customers who choose a full-service remodeling company, trust our guidance, experience and “one-stop shopping” to provide a positive, stress-free experience. Why	Choose	Us For Your Project? At Heritage, we are 100% committed to customer satisfaction on every project! We always go the extra mile to make our customers completely happy. We know that our success depends on your recommendation of us to neighbors, family and friends. We take great pride in our extensive repeat and referral customer base. We strive to make the remodeling process as stress-free as possible. You can feel confident that the Heritage team will take good care of you and your home, as if it were our own home. Our goal is to provide a beautiful and functional renovation of your home while maintaining your comfort and well-being. What makes us so much better then the rest? Full Service. Everything is in-house. From designing your layout to choosing materials, to the execution and management of your project, we do it all with you. All of our fully licensed & insured craftsmen are under one roof, including electricians, cabinet installers, plumbers, tile installers, sheetrockers, framers, hardwood installers, etc. Considerate & Friendly Craftsmen. We know that your kitchen and bathroom are centers of everyday activity, and our field employees are sensitive to the need for a clean worksite and minimal disruption to your daily routine. Over 25 Years of Residential Remodeling Experience. Since 1983, Heritage has earned a reputation for top-notch service and craftsmanship. Our own employees do the complete job, neatly and on-schedule. 3-Year, Rapid Response, No-Hassle Warranty on all Labor. Other contractors are only required by law to provide a one-year warranty; although, you may find many who will be reluctant to respond & comply at all. Fully Licensed and Insured. That includes every one of our professional workers who comes through your door. Copies of certificates are available upon request. Complete Showroom. Our 3,500 square foot showroom and design staff provide the perfect environment for planning your kitchen or bath remodel. Quality Products. Name brands that you can trust. Our designers can guide you to products with a proven record of performance. See our Products page for links to manufacturers' websites. Free Estimates. Not sure what your planned remodel will cost? Call for a complimentary appointment with one of our designers to review and discuss your project with you. Full or partial remodeling. 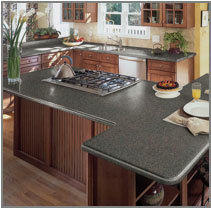 While complete kitchen and bathroom remodels are our specialty, we do as much or as little as you like.